If you have a child who wears braces, or if you wear Invisalign braces or conventional braces yourself, regular trips to the orthodontist are part of your schedule. Seeing the orthodontist after school or taking time off from work to make an orthodontic appointment isn’t always convenient. At Roberts & de Marsche, we offer Saturday appointments to simplify your life. Weekends are often booked with sports, parties, family time, or rest. But weekdays are booked with work, school, homework, afterschool activities, and more. For those whose have greater flexibility on weekends, it’s helpful to know you don’t have to squeeze one more obligation into your busy weekdays thanks to the availability of Saturday appointments at your Center City orthodontist and Philadelphia Invisalign provider. Schedule your appointment in Center City, Philadelphia, so you can get your orthodontic visit taken care of and still make time for living, working, or playing in the city. Our office is located on Walnut Street on the top floor of the Medical Arts Building. Make your Saturday appointment in Lawrenceville, NJ, because the last thing you want to do on the weekend is go back into Philadelphia for an orthodontist appointment. Our office is located on Franklin Corner Road. You don’t have to worry about getting back to work quickly or your child missing too much school because of braces. Braces for the whole family: Maybe your elementary-school-aged child needs interceptive orthodontics. Perhaps your tween or teen has just started their orthodontic treatment. And maybe you have finally decided it’s time to get the straight teeth you have always wanted. Roberts & de Marsche offers both youth and adult braces, including Invisalign Teen, so your whole family can get their orthodontic treatment in one location. All types of braces: Braces are not one-size-fits-all. The current alignment of your teeth, your age, your smile goals, your budget – these elements are all taken into consideration when determining what type of orthodontic treatment is best. Adults especially appreciate having options for discreet braces, like nearly invisible aligners from a Philadelphia Invisalign Elite Preferred provider, so they can pursue a straight smile without anyone really knowing about it. Efficiency: We know you’re busy – hence, the Saturday appointments – and we focus not only on the most effective treatment to align your smile, but also the most efficient method. Every type of orthodontic treatment takes dedication, but part of orthodontic success is having braces that work for your lifestyle. Comfortable offices: It helps to visit an orthodontic office where you feel comfortable. We have worked hard to create a familial atmosphere at both our Center City and Lawrenceville locations, with quiet and comfortable reception areas, separate game rooms, and private treatment rooms. Affordability: Yes, braces can be costly, but we want you to have a healthy smile, so we offer extremely competitive treatment fees, a new client special, and easy financing and insurance options. We will find a way to make your braces affordable for you or your child. We want to make your schedule easier, not more complicated. 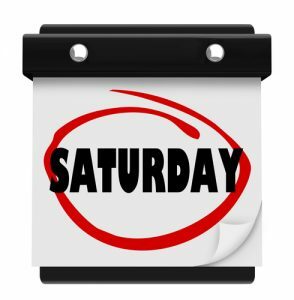 Get on the schedule for a coveted Saturday appointment. Contact us to find out the availability for Saturday appointments, and whether you or your child can be seen in Center City or Lawrenceville.